Three of the first six degrees granted by Carleton in October 1946 were awarded to Journalism students. Journalism program founder Wilfrid Eggleston discusses newspapers with a group of Carleton students in 1958. The university’s journalism program was launched in October 1945, partly in response to the strong demand for instruction in the field coming from soldiers who returned to Ottawa after the Second World War. The program was spearheaded after 1947 by the distinguished newspaper columnist, historian and public servant Wilfrid Eggleston, widely viewed today as the father of journalism education in Canada. By the time Carleton’s sprawling new campus opened along the Rideau River shore in 1959, journalism had grown from its humble beginnings in rented space in downtown Ottawa – to become one of the university’s signature degree programs. “Our first quarters in the old building on First Avenue consisted of two small rooms on the second floor,” Eggleston recalled in his 1968 autobiography, While I Still Remember. “Our first equipment took the form of half a dozen ancient typewriters, bolted to benches alongside the walls… Our first library consisted of a short row of books in my office. Canada’s original journalism school went on to prepare its thousands of graduates for careers in the news industry and a host of other fields that required research skills, public engagement and effective communication. 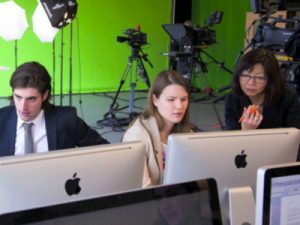 Susan Harada (right), current head of Carleton’s journalism program, works with a team of TV students. Throughout these early decades, a belief took hold that Carleton journalism students should not only receive practical training but also a broad and deep university education embracing the arts, humanities, social sciences and other spheres of knowledge. 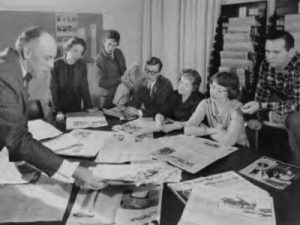 Founded during the golden age of newspapers, Carleton’s J-School remained a key training ground for print journalists even as it evolved, by the 1970s, into the country’s top degree program for television and radio professionals, as well. During that decade, the school added an academic Communication program to critically examine the role of mass media in society. As the school expanded and matured, its faculty members emerged as authoritative voices on national issues related to the news industry, journalism ethics, media law, politics and more. The tradition of change and adaptation continues as Carleton’s School of Journalism and Communication prepares new waves of graduates for careers in a digital world dominated by ever more social, mobile and dynamic means of spreading news, opinion and information. Now located in Carleton’s Richcraft Hall, where students have access to the latest in television, radio and online production technologies, the journalism program celebrated its 70th anniversary in 2015 and will be featured prominently as Carleton University prepares to mark its 75th anniversary in 2017. The 70th anniversary of the Journalism program in fall 2015, the 70th anniversary of the conferral of the first Journalism degrees in fall 2016, and the birth of its new publication Capital Current in fall 2018 all highlight our school’s storied past, while showcasing its headlong rush into the digital age.